He's the leader of the NEO-VIPERS, the troops that form the backbone of the COBRA legions. Totally mean, completely obedient and willing to betray anyone to get ahead, he trains the NEO-VIPERS in all forms of combat and has them ready to deploy on missions at a moment's notice. Like all NEO-VIPERS, he is highly trained and outfitted with techno-engineering to withstand all types of severe weather. 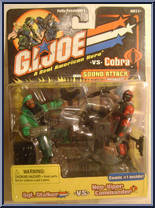 He thinks that he is superior to the G. I. JOE guys, but SGT. STALKER has ruined the commander's missions involving EODs (Explosive Ordnance Devices) by successfully locating and destroying the bombs before they could explode. The commander now keeps trying to design a device that cannot be eliminated, even by SGT. STALKER. "I train my NEO-VIPER troops to be just like me: mean and rotten right down to the soles of their boots." The U.S. military needs professionals who know how to disarm and destroy explosives. The bombs may be in an enemy's storage buildings, or they may be bombs that the U.S. Army no longer needs. Either way, highly trained Explosive Ordnance Disposal (EOD) Technicians, like SGT. STALKER, are there to make explosive devices safe. They are trained at the military's EOD Training Facility, where they learn how to find, identify, access [assess? ], and eliminate EODs. Depending on the kind of explosive and the situation, SGT. STALKER may blow them up where they are, move them then blow them up, or disarm them on the spot. Like all EOD techs, he stays up-to-date on the new explosives that are being made, so that he will know how to deal with them. Explosive munitions are a favorite of NEO-VIPER COMMANDER, and SGT. STALKER has had to render many deadly EODs harmless after a visit from the head of the NEO-VIPERS. Contribute pictures, update details or suggest corrections for Sgt. Stalker vs. Neo-Viper Commander. Write a review about Sgt. Stalker vs. Neo-Viper Commander.